Pooja room door designs are important as they act like a barrier between the pooja room and other parts of the house. 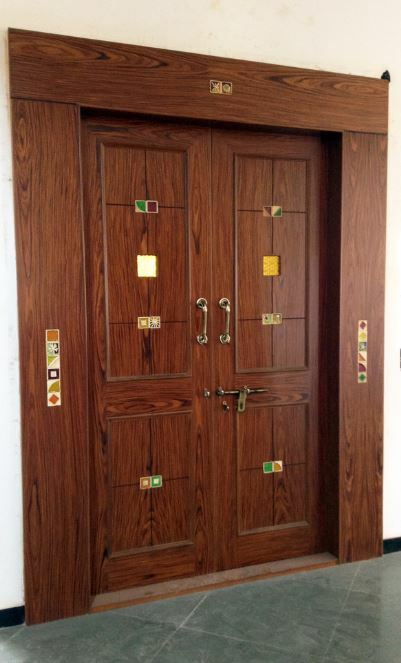 Pooja room door designs in wood and glass are very popular. People love wooden doors with bells and intricate carving on them. 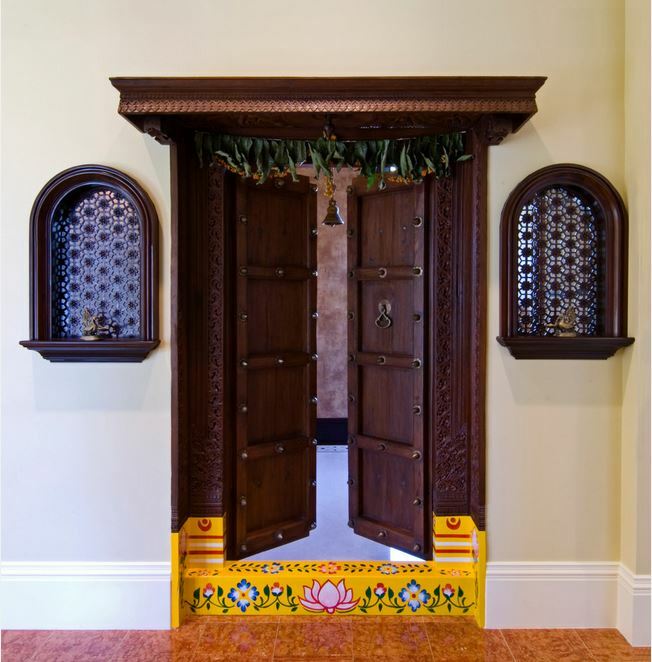 Here are some pooja room door designs, check them out. 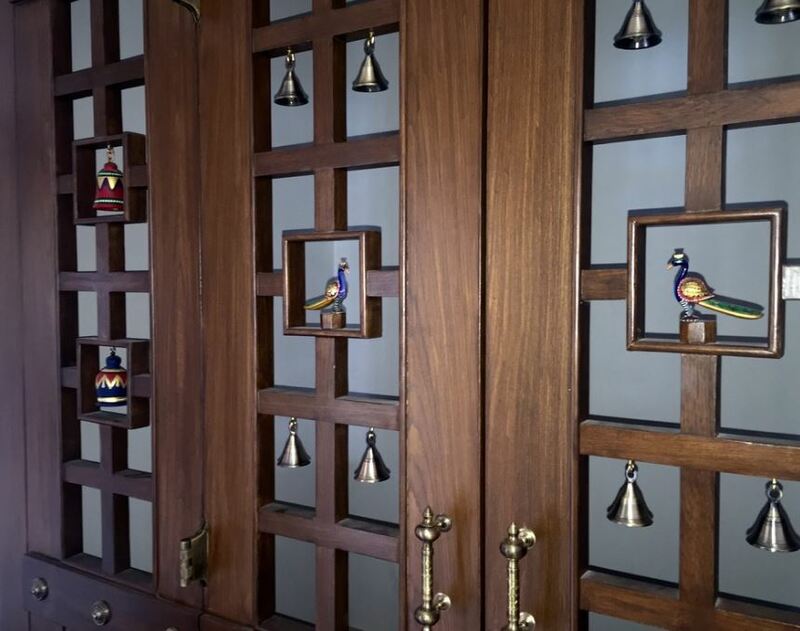 Check out this gorgeous peacock themed pooja room door. In addition to peacock it also has bells on it. This pooja room door has picture of deities painted on it. I love this colorful door. 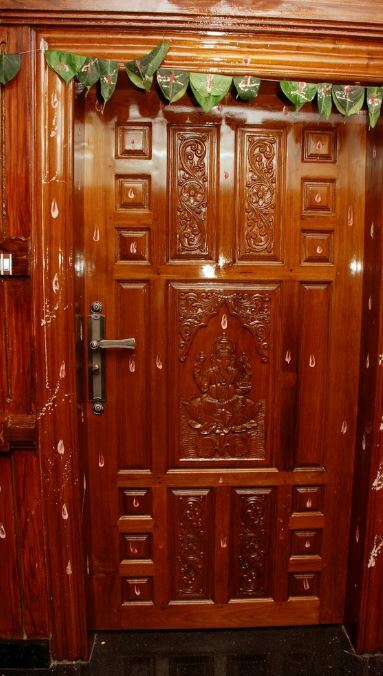 You can use wood veener to do your pooja room door. Add some handmade cracked glass tiles inlay to it. 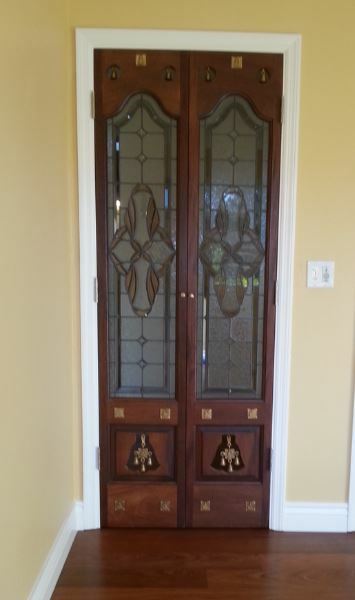 Go for a combination of wood and glass for your pooja room door design. 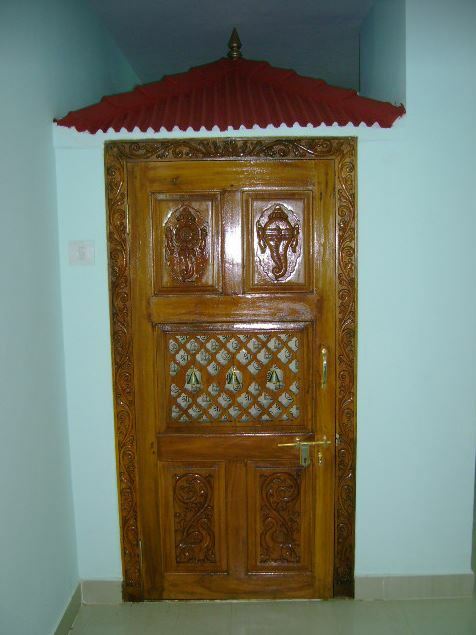 Here is an intricately carved wooden pooja door. 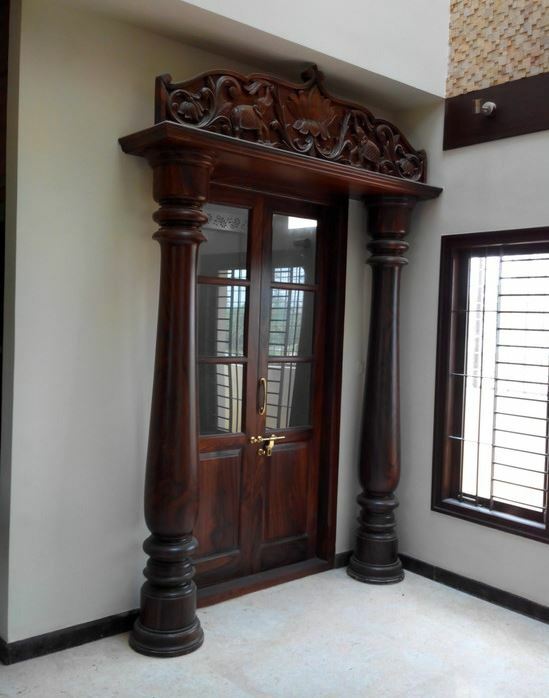 These kind of traditional doors are mainly found in south Indian homes. 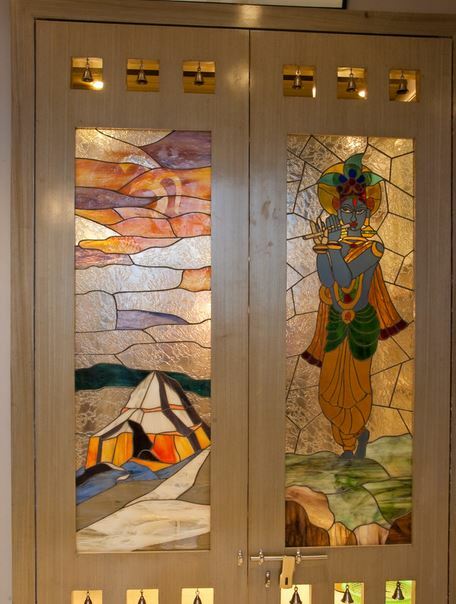 This is an awesome glass pooja room door with lord Krishna on one and Kailash Mountain on the other. Attach a few bells to the door to make it more attractive. This glass door separates the pooja room and the living room. It defines the pooja space without blocking it. Pooja room should have a door with two shutters. This is a pretty door made of wood and glass. The horizontal and vertical design makes it unique and interesting. You can go for this simple pooja room door design. The frame is made of wood and has been painted white. The glass has lord Ganesh and bell design on it. Go for this pooja room door design. 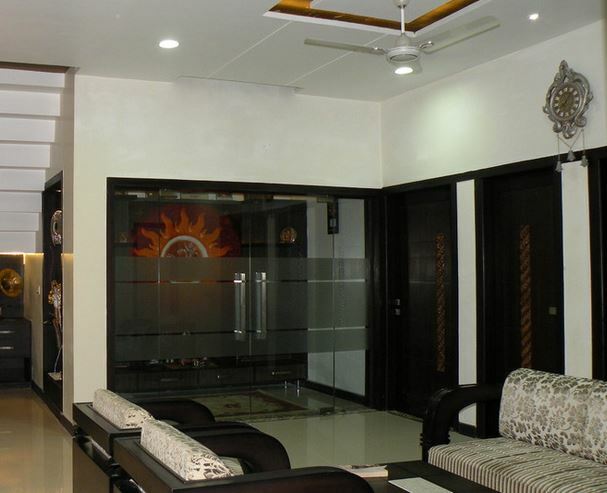 A glass door can make your pooja room look elegant and divine. This is a lovely door with small bells on it. 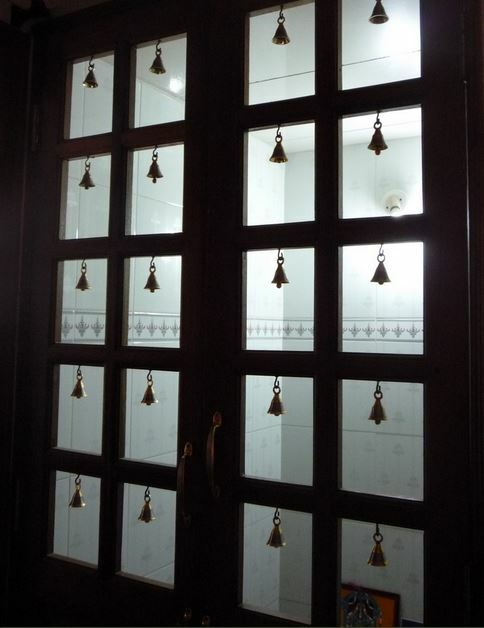 Bells can add beauty of your pooja room. You can easily get a glimpse of your deity from these doors. 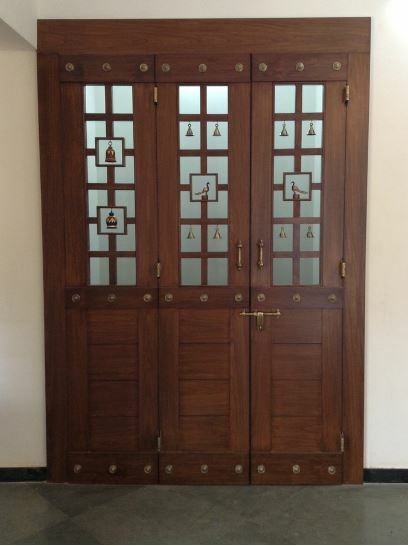 Check out this pooja room door design with one shutter. It has detailed carvings and small bells attached to it. 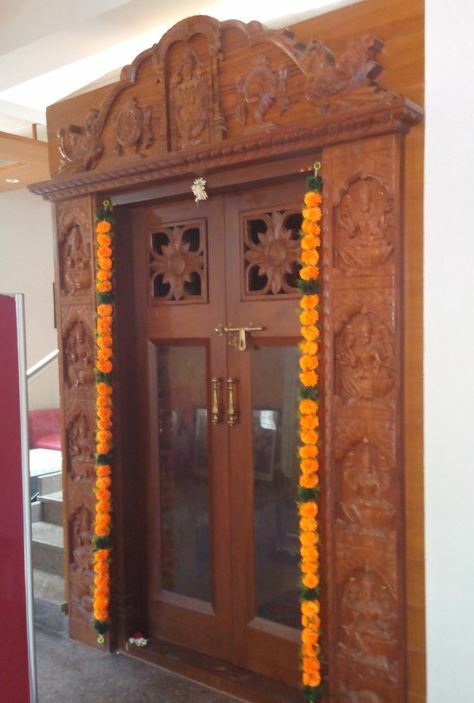 Here is a pooja room door design in solid wood. Paint the threshold in yellow color and add colorful floral designs on it. Create this traditional pooja room door in your house. 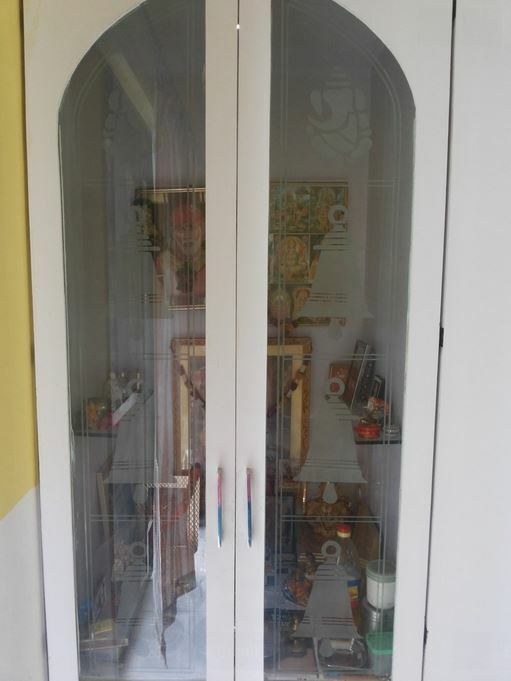 Get goddess Lakshmi engraved on the frame of the door. 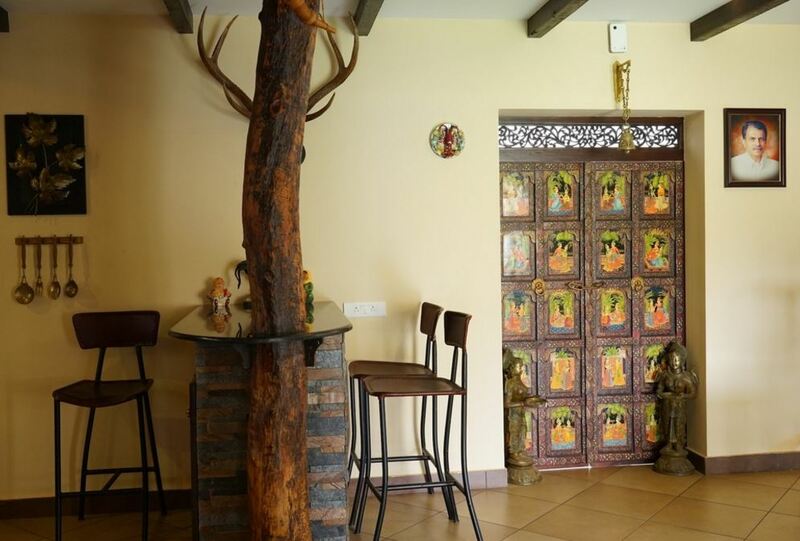 This pooja room door creates the look of a temple. The wooden pillars on either side of the door provide support to the entire structure. 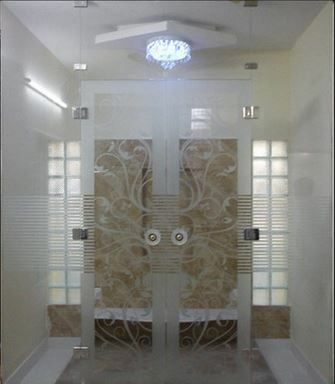 This entry was posted in Pooja Room, Pooja Room Designs and tagged Modern Pooja Room Door Designs, Pooja Door Bell Design, Pooja Door Designs Photos, Pooja Door Designs with Glass, Pooja Room, Pooja Room Design, Pooja Room Design for India, Pooja Room Designs, Pooja Room Designs for Apartments, Pooja Room Designs for Flats, Pooja Room Designs for Homes, Pooja Room Designs for Small Homes, Pooja Room Door Designs, Pooja Room Door Designs in Glass, Pooja Room Door Designs in Kerala, Pooja Room Door Designs in Wood, Pooja Room Door Designs with Bells, Pooja Room Door Designs with Glass, Pooja Room Door Designs Wood, Pooja Room Door Models, Pooja Room Glass Door Designs Images, Pooja Room Interior Design, Pooja Room Pictures, Pooja Room Wooden Designs, Simple Pooja Room Designs, Small Pooja Room Designs by Homemakeover. Bookmark the permalink. I never heard about pooja designs until now. They give me the rock star feels just looking at them. Thanks for sharing.